Many stunning photographs of Folke Ohlsson's popular, quintessentially Scandinavian chairs and sofas, with their natural wood frames and simple upholstery, span the Internet. In contrast, the Swedish designer’s biographical details remain sketchy. Various sources say Ohlsson was born in Sweden in 1919 and died in Atherton, California, in 2003 (1). After he studied at the School of the Gothenburg Society of Industrial Design, he eventually designed for DUX, a furniture and bedding manufacturer in Malmo, Sweden. We also know Ohlsson travelled to the United States in 1950 to assess that country's market for Scandinavian furniture. Seeing commercial potential, he opened Dux Incorporated (also named DUX Inc.) on a small scale in 1951(2). In 1956 he expanded the business to a new factory in Burlingame, California. 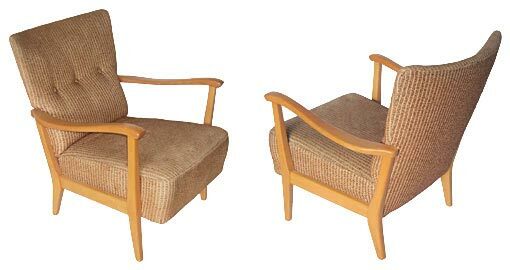 His designs incorporated American upholstery using wooden components and knock-down hardware imported from Sweden. Ohlsson's connection to Vancouver during the 1950s may be less known. In 1952, before he expanded his operations in California, Ohlsson granted rights to produce some of his designs to Vancouver manufacturer A. P. Madsen Ltd.
Madsen started in the mid-1930s, and by 1952 employed over 120 workers to become the largest manufacturer of upholstered furniture in Western Canada. In that same year the company moved to a state-of-the-art manufacturing facility at 1122 SW Marine Drive in Vancouver. Here they produced several different Ohlsson-designed upholstered chairs, love seats, sofas, stools, and a coffee table. The Madsen Modern line of knock-down furniture included all Ohlsson's pieces, manufactured entirely in the Vancouver factory, according to the Canadian Woodworker (October 1954). Madsen fabricated the "show wood" frames, with beech imported from Japan — dried, milled, cut, joined, sanded and finished on-site — and also did all the upholstery to Ohlsson's design specifications. 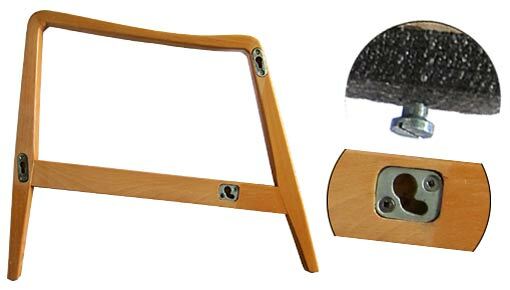 They only imported Ohlsson's ingenious knock-down hardware from Sweden, patented in the United States. Madsen's manufacturing process resulted in the production of modular arm assemblies and upholstered units, stored in racks prior to shipping knocked-down. This method saved warehouse space and reduced transportation costs. Though common now, Madsen's use of modular components introduced the revolutionary concept of knock-down furniture to 1950s North America and to Vancouver, far removed from Canada's traditional furniture manufacturing centres in Ontario and Quebec. In 1954 A. P. Madsen Ltd. amalgamated with Restmore Manufacturing Co. Ltd., a large Vancouver mattress and furniture company established in 1903, to form Restmore-Madsen. They continued to produce Ohlsson's designs under the DUX Modern label until about 1956, when production shifted to the United States. 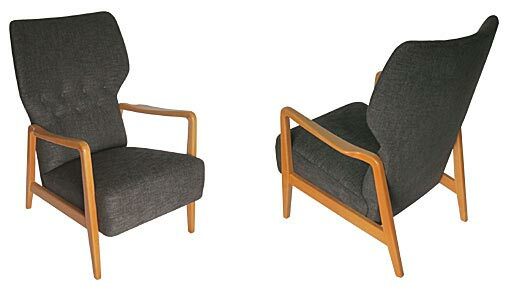 Madsen's brief production of Ohlsson's designs helped pioneer the knock-down concept to the international success of DUX and other Scandinavian furniture producers starting in the late 1950s and to global companies, such as IKEA, up to the present day. Together with dazzling photographs of his designs, a more thorough, future biography of Folke Ohlsson should document this unique association with Vancouver. Impressed by Madsen's high-quality and sophisticated production methods, the Ottawa-based National Industrial Design Committee (later Council) included several chairs from the Madsen Modern line in its Design Index. Established in 1947, the registry of mainly Canadian-designed goods for home and office promoted "good design" to the public and manufacturers. Freelance curator and furniture designer Allan Collier maintains the West Coast Design Collection of Canadian design artifacts (1945—80). For future research he'd be grateful for information about Vancouver designer Helmut Krutz and Vancouver manufacturer Columbia Furniture.